A square has four equal sides. No matter which way you look at it or which way you turn it, the shape always looks the same. Begin by using masking tape to create a large square on the floor of your classroom. Ask the children to sit around the shape (the same number of students on each side) and have them observe the square’s characteristics. Children will notice that a square has four corners and that the length of each side is the same. Play some spatial direction games with this large square. Have the kids jump inside, stand to the right of the square, to the left, and so on. Next, give each child a large rubber band and challenge them to use only their thumbs and index fingers to form a square. Give each child a sheet of graph paper (large squares). 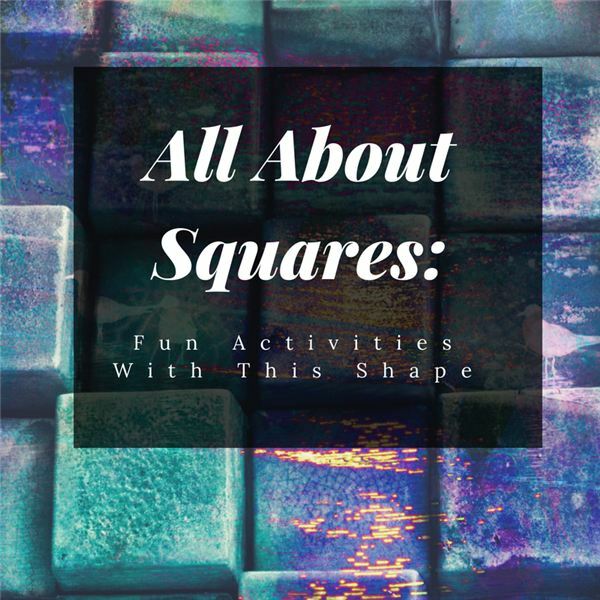 The object of this activity is to highlight squares as well as give students practice with cardinal directions. Be sure to mark the top of the paper with a compass (north, south, east, and west). Color 3 squares to the south. Color 4 squares to the east. Color 6 squares to the north. Color 2 squares to the west. Continue calling out directions until the children tire of this game. Mixed-up square puzzles will be a fun addition to your square theme. Find a large picture in a magazine, the front of a cereal box, or a drawing the child has colored. Take a black marker and draw a grid with nine equal square sections. Invite the children to cut out the squares and mix them on the table. Challenge the kids to put the puzzle squares back together again to form the picture. Store the puzzle pieces inside a zipper-lock plastic bag. A mosaic is a picture or pattern created by arranging small colored pieces of materials – it could be paper, tile, glass, etc. In class, invite the children to create a mosaic pictures with square pieces of construction paper. First, draw a large shape in the middle of a sheet of light construction paper or cardstock. Next, have the kids cut squares from colored construction paper. Set out glue and cotton swabs on the table. Invite your students to use the swab to dot glue onto the colored squares and place them inside the shape. Make paper weavings by giving each child two different colored eight-inch paper squares. Measure and mark off one-inch strips on each paper. Cut slits in one of the squares and cut the other sheet into strips. Show the children how to weave by taking the first strip and weaving it over and under the attached strips of the square. Tape ends of the strip to the edge of the square. Weave the second strip in an alternate fashion and again tape the ends down. Then, continue weaving until the square is filled. Make this a cooperative project by combining all the students’ weavings into a spectacular square tapestry (quilt). Challenge your student’s thinking skills with this game. At the beginning of the week, attach a picture with a familiar object on the bulletin board and cover it with a large sheet of construction paper. To the bulletin board, add the words, “Take the Mystery Square Challenge." Post three clues beside the square picture. Also attach a large envelope on the board. Provide slips of white paper and instruct the kids to read the clues and try to identify the picture. Have them write their guess and name on the slips of paper and place these into the envelope. At the end of the week, remove the cover to the picture. Check the guesses to determine who wins the Mystery Square Challenge. Squares will be easy to make since the toothpicks are equal in length. Each player will need the same number of toothpicks and some markers (square pieces of construction paper – one color per child). The object of the game is for a player to complete the greatest number of squares using his/her allotted toothpicks. A player begins by placing a toothpick on the table. Each child takes a turn attempting to make a square by placing the pick next to or across from the other toothpicks. If a player finishes a square he places his marker inside that square and takes another turn. When all the toothpicks are gone, the player with the most markers inside squares is the winner. For more learning all about squares, check out this article on Bright Hub Education.